Language matters. And I’m realizing that there are so many things I’ve said in my first decade of teaching, often with the best of intentions or even just offhandedly, that may have been confusing, problematic, or simply untrue. I’m sorry I said those things. I’m grateful for the conversations, experiences, and continuing education that have shown me why they weren’t so helpful for my students, and what I might say instead to facilitate a more empowering and welcoming class experience. That said, I recognize that there are most certainly things that I say and teach now that will make future-me cringe. That’s why it’s so important for us as teachers to keep learning, keep questioning, and have the conversations that challenge and deconstruct our previously unquestioned assumptions about yoga. I’m sorry I said those things. I’m grateful for the conversations, experiences, and continuing education that have shown me why they weren’t so helpful for my students. In that spirit, below is a (non-exhaustive) list of things that I don’t say in class anymore (and why). “Use a strap if you need one.” “Grab some blocks if you need them.” “Go to the wall if you need to.” I’ve said these phrases a lot. In fact, they’re probably right up there with “remember to breathe” and “let’s meet up in downward facing dog” on the “things Kat has said most in yoga class” list. And let me be clear: I LOVE props. I want the people in my classes to take full advantage of props and to feel empowered to incorporate them into their poses whenever and however they are most beneficial. But when it comes to making yoga class a prop-friendly environment, I’ve learned that “use a strap/block/whatever if you need one” just doesn’t cut it. For one thing, a student may not know whether they need a prop. They also might not know how to use said prop, or they might feel that they’re not doing “the real pose” if they incorporate a prop. If I want my students to benefit from props, I actually have to teach them the ways in which they might benefit from props. And then to change the language I use when I talk about the props. Because props are actually super-rad. And they’re most definitely not just for beginners or the “inflexible.” But when it comes to passing this message along to students, the words we use when we offer props can make all the difference. Instead of “if you can’t touch the floor,” or “if you’re not flexible enough for the bind,” why not “here’s a cool trick you can try with your blocks,” or “check out what happens if you catch hold of your strap in this pose”? Rather than treating prop-supported asanas as the next-best thing to the real thing, we teachers have the opportunity to utilize props so that they help students of all levels explore poses in new and innovative ways. What muscles can they activate by pressing out against straps looped around their shins or thighs? What additional space and comfort might they find in their poses by placing blocks under their hands? How might they discover more chest opening in a bind by incorporating a strap? How can the wall serve as a tool to explore new and interesting pose variations, or to hone in on a specific action or area of the body they might like to focus on? If in lieu of a vague mention of blocks and belts on a classroom shelf, we use clear, specific, and positive language to talk about props, we can help our students get the most out of their yoga practices. As teachers, we should never presume that anyone in class wants to lose weight. People of all body types come to yoga for a variety of reasons. We especially shouldn’t assume that a particular student came to class to lose weight (or that they’re interested in losing weight at all) based upon their body shape or size. Or that maximum calorie-burning is a universal goal that everyone in class is seeking to achieve. Or that everyone wants to “get rid of muffin tops” or “saddle bags” or [insert other body-shaming names for common adipose tissue accumulation in the human body here]. We should never presume that anyone in class wants to lose weight. Even though I never used a ton of overt weight-loss language in yoga class, looking back, I can see how I managed to unconsciously sneak it in. This was done mostly in the context of referring to what I thought at the time were “universal” desires and experiences—those little comments about “working off” holiday meals or treats, or about losing or preventing the accumulation of belly fat. And the truth is, those comments can be just as hurtful, shaming, and triggering. But I didn’t really get that until I found myself on the receiving end of weight-related comments in yoga class—specifically, the well-intended “You look great! Did you lose weight?” I know these comments are almost always meant as genuine compliments, but here’s the truth: I wasn’t trying to lose weight, and I wouldn’t know if I had because I don’t weigh myself. That’s because from the time I was seven years old up into my early twenties, my life pretty much revolved around my weight (or more accurately, my eating disorder). For me, making a conscious decision to not weigh myself was a big part of getting healthy. But whenever well-intentioned yoga teachers complimented a presumed weight loss, thoughts like Should I be trying to lose weight? Does my teacher not approve of my weight? Did I not look great before? immediately crossed my mind. And I started to understand why weight-loss-related comments don’t belong in the yoga studio. This also means avoiding body-shaming language when we describe pose benefits, like mentioning that a particular pose or exercise can reduce fat in a particular area of the body (think “twists will get rid of love handles!” for example). For one thing, comments like these reinforce unhealthy cultural norms about what a “desirable” body should look like. And for another, they’re not even accurate; you can’t “spot-reduce.” You actually honest-to-god cannot “crunch away” abdominal fat, twist your way to a narrower waist, or chair-pose your thighs smaller. Human physiology doesn’t work that way. What if instead of focusing on yoga as a means to “fix” ourselves or our students, we instead focused on the ways in which practice can be used as a tool for self-acceptance and body positivity? What if instead of commenting on what our students’ bodies look like, or what we assume they want them to look like, we focused on the the incredible work their bodies are doing each and every time they come to class? What if we stopped automatically correlating health with thinness? And what if instead of false promises of flatter abdomens and thinner thighs, we focused on all of the magnificent internal benefits that practice has the potential to offer? Benefits like self-acceptance, stress reduction, and being part of a community. Or your left hip. Or your lower back. Or anywhere other than your lungs. As a practitioner, I actually really like cues like this. They help me to bring my attention to (and often release unconsciously held tension from) the parts of my body that could generally use a little more attention. That’s why I used to give them often. But eventually, after receiving some helpful student feedback, I learned that “breathe into [insert body part here]” isn’t a cue that works for everyone. For one thing, some students will automatically think Oh my God, does she really think you can breathe into your little toe? I’m far from an anatomy expert, but I’d rather my students rest assured that, as their teacher, I at least know enough about the human body to understand that they can’t actually, physically breathe air down into their pinky toes. And even if they’re not scrutinizing my anatomy and physiology credentials, for other students this is simply a confusing, abstract instruction that can be easily misunderstood, ignored, or worse, can make them alienated, like they're “not advanced enough” to be in this yoga class. Just because I enjoy or benefit from a certain cue, it doesn’t mean that everyone else will find that particular cue helpful. Breath mechanics aside, perhaps the most important lesson I learned when I discovered that an instruction I often gave was confusing for a lot of my students was this: Just because I enjoy or benefit from a certain cue, it doesn’t mean that everyone else will find that particular cue helpful. This is why it’s important to learn to give instructions in different ways. Because ultimately, everyone’s experience of yoga is different, and not everyone is going to understand or describe their practice in the same way. I said this a lot. I mean, I wanted to provide pose options, and it seemed pretty straightforward, right? “If you’re less ‘flexible,’ try this option, if you’re more ‘flexible,’ do this one.” Everyone does the variation that’s appropriate for them. Simple, right? Except not, because when it comes to yoga, “flexible” can be an especially loaded word. Because there’s such a strong correlation between yoga and flexibility, there’s an underlying perception that “if you’re flexible, you’re good at yoga.” Meaning “if you’re inflexible, you’re bad at yoga.” “Flexible” then becomes a litmus test for who does or doesn’t “belong” in yoga class. (Despite the fact that yoga is, of course, about far more than flexibility, and hypermobility can cause problems of its own). In that context, who wouldn’t want to be a member of club-flexible? “Flexible” is also not always a clear or accurate description when it comes to offering pose options. Flexible how? For example, I have very open hips and hamstrings, but very tight quadriceps and calves. Do I get to be part of the “flexible” group or not? And sometimes the option given “if you’re more flexible” has little to do with flexibility, and a lot more to do with body proportions. A student with shorter legs and a longer torso is naturally going to have an easier time touching the ground in a standing forward bend. A student with longer arms is naturally going to have an easier time bringing their palms flat to the floor in staff pose. 5. “Wring out toxins,” “squeeze out toxins,” “sweat out toxins,” anything about toxins. 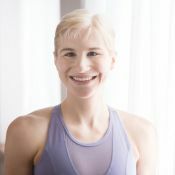 I’ve written and podcasted before about why claims that sweating or twisting out tons of toxins in yoga class aren't super-scientifically sound. But pseudo science aside, there’s another reason why I’m not really comfortable with toxin talk in yoga class anymore. On a more subtle level, if we as teachers constantly talk about how “toxic” our students’ bodies are, what message are we actually sending? “Your body is gross. Toxic. It needs to be purified. Fixed.” (Often by costly products and services.) And I know that for some, this might sound like a stretch—like maybe I’m being overly sensitive, or too PC. But the way I see it, while the increasing presence of environmental toxins is certainly itself an important issue that needs addressing, the constant yoga-related marketing of various ways to “detoxify” ourselves is problematic. If we as teachers constantly talk about how “toxic” our students’ bodies are, what message are we actually sending? We live in a culture where we (women in particular) are constantly told that our bodies are gross, and that we need to spend money on tons of crap in order to make them “less gross” (everything from juice cleanses to labiaplasties). As a teacher and a student, I want my yoga classes to be a safe haven from that, a place where everyone feels accepted. To send the message to my students that even if they never did another sweaty sun salute or chanted another “om” in their lives, they’re “enough” just as they are. To present yoga as something we do because it feels good, a gift that we give ourselves out of love for our bodies, not something we punish ourselves with because we feel gross. Stepping outside of our comfort zones can be a wonderful thing. In fact, all of my most cherished life experiences are direct results of choosing to step outside of my comfort zone. And in yoga class? Going outside of my comfort zone has allowed for some of the most frustratingly fabulous, practice-shifting asana moments ever. As a teacher, my aim is to create a safe, supportive environment for students to step outside of their comfort zones if they choose. But it’s not my job to pressure another person to do something they’re not comfortable with, or to assume that I even know what is or is not a part of their individual “comfort zone.” After all, life can be harsh and uncomfortable enough as it is, and yoga class offers many people a rare and much-needed respite from that. I’m sorry if my own attempts to encourage others out of their comfort zones ever made anyone else feel like they didn’t want to come back to yoga class. In years past, I used to regularly ask students to do things like walk around the room gazing into each others' eyes, or to “grab a partner” multiple times per class—activities that I myself didn’t even really enjoy, but that I thought were necessary to “facilitate growth.” You know, to “get people outside of their comfort zones.” When I was asked to do those things in class myself, sometimes they ended up being useful (I even made a friend or two that way), but other times they just made me feel anxious and panicky—like hey, this isn’t what I signed up for, I just want to practice yoga, and like I didn’t want to go back to yoga class. I’m sorry if my own attempts to encourage others out of their comfort zones ever made anyone else feel like they didn’t want to come back to yoga class. The same can be said for trying challenging asanas. Feeling safe, confident, and supported can be just as important as physical preparation when it comes to exploring new and challenging poses. As I’ve grown more confident and experienced as a teacher, I’ve come to realize that I don’t have to incorporate partner work into every class just because I’d been told it was a good idea at a workshop or training. And when I plan my classes, instead of fretting about what I “should” be teaching, I focus on teaching the sort of class that I myself would actually like to take: a class where I feel encouraged to expand my boundaries without feeling pressured to do something that doesn't feel safe. Fellow teachers, and students, do you have anything to add to this list? Let me know in the comments below. Let’s have a conversation!